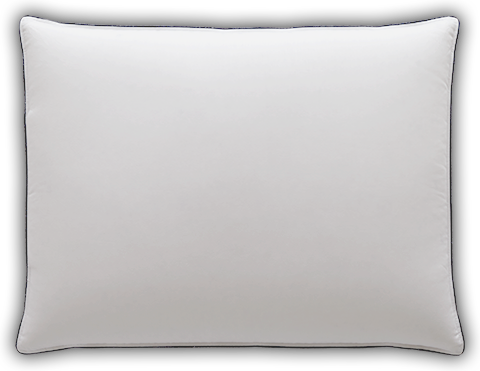 Snuggle in for a great night’s sleep with our soft support Classic pillow featuring fluffy premium down covered in cotton sateen giving you inviting softness inside and out. Straight up and down, this is a quality pillow. The down feels luxurious. It's made of quality materials, and the stitching is tight so the down doesn't get out. You may have just found your dream pillow. Pacific Coast® Classic soft support pillow holds the ideal amount of fluffy 550 fill power of Hyperclean® down fill so you can sink your head into inviting softness and loft. The 500 thread count, 100% cotton sateen cover is wonderfully silky adding to the overall quality of this beautiful pillow. Navy blue printed cording is a sleek finishing accent and the machine care gives you yet another reason to make this traditional pillow your very own.